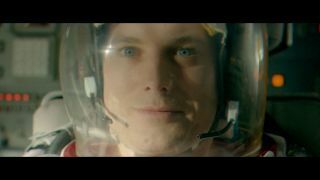 Audi’s 2016 Super Bowl 50 ad, "The Commander," tells the story of a retired astronaut who rediscovers his lust for life. A new TV commercial set to air during the Super Bowl blends the imagery of NASA's Apollo program with the score of David Bowie's "Starman" to challenge car buyers to "choose the moon." "The legacy of the first moon landing lives on at Audi. The same spirit of discovery drives us to dream, innovate and explore, from creating a car that goes 205 mph [330 km/h] to building a lunar rover," the car company proclaimed on its website. "It's why we're constantly pushing the boundaries of what's possible." Scott Keogh, president of Audi USA, and Apollo 17 astronaut Gene Cernan at the 2016 North American Auto Show in Detroit in January 2016. In addition to NASA footage of Saturn V rockets launching to the moon, the ad also features the 1972 song "Starman" by David Bowie, who died on Jan. 10. The song, one of Bowie's most famous tracks, has received renewed attention as of late, in part due to the singer's passing, but also because it was featured in the movie "The Martian." "Is there an interest in cars? An interest in space? Is there interest in innovation? There it is, folks," said Gene Cernan, commander of the Apollo 17 mission, which was the last to land astronauts on the moon in 1972. In addition to promoting the new R8, the fastest and most powerful Audi of all time, the ad is also a subtle reference the company's involvement in the Google Lunar X Prize. In June 2015, Audi partnered with the Berlin-based team Part-Time Scientists to build the Audi Lunar Quattro rover, an entry in the private moon race. Watch the extended cut of Audi’s Super Bowl ad, "The Commander," at collectSPACE.com.